Recently, I've posted several articles on the Squamish/Suquamish people of the Pacific Northwest, so it is especially a pleasure to discover a beautiful online journal of canoe journeys of the Suquamish people of Puget Sound, Washington State, USA. The journal covers their canoe journeys made in 2011 and 2012. 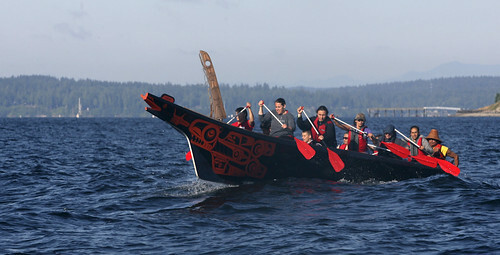 An article in the New York Times also describes the recent history of Squamish/Suquamish canoe cultural celebrations. Currently, a group of Suquamish are visiting another famous canoe people, the Maori, in New Zealand. The Canoe Journey Journal has a short post describing this visit: Suquamish visit to the New Zealand Maori. Hopefully, there will be more posts soon. Thanks to Terry for telling us about this. Can You Trust Jared Diamond? Are We Losing the Race Against Climate Change?